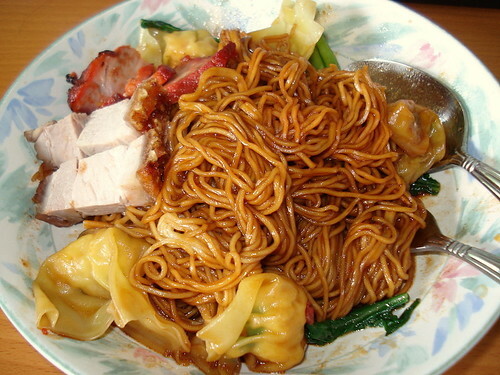 Homemade wantan mee, originally uploaded by Camemberu. Sorry, didn't take note of ingredients and measurements so no recipe here. Some odd dash of dark sauce, light sauce, sesame oil, etc. But this was quite yummy! Noodles QQ (al dente) and wantans crunchy with lots of water chestnuts. Only char siew and roast pork was bought from market. oh, pray tell the recipe for the sauce please! !